If you have lots of battery powered devices in your home, it is important that you should know how to clean leaking AA batteries. 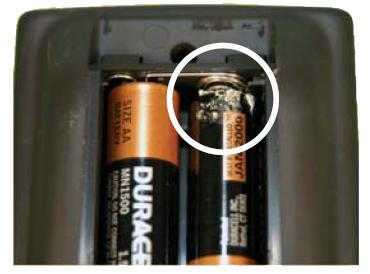 Sometimes leaving the batteries for too long causes them to leak especially when the device is not in use for a long time. Just like the two AA duracell batteries in our remote control that i found out last week leaking because the device was not in use for a long time. Sometimes leak is also cause by puncture in the batteries. It is important to clean up immediately the leaking AA batteries as soon as find out that its leaking, otherwise, the battery acid can damage the electronics device because it can cause corrosion on the PCB layout and electronics components of the device which can lead to short circuit. Here’s how to clean up leaking AA batteries, the cleaning method only differs depending on whether the batteries that have leaked are alkaline or acid. 1. The first thing to do is to choose a well-ventilated area. This is to prevent you from inhaling the harful fumes of the leaking battery. Outside your house is ideal place to clean up. If you chose to clean up the battery inside your house, make sure that you turn on your fan to keep air moving. 2. Next thing to do is to put rubber gloves and protective eye wear. Please dont skip this step, Obviously, this is to protect your hand and eyes from leaking battery acid. 3. Now, determine wheather the battery is alkaline or acid. If the battery is alkaline then you should use acid to clean it up, if it is acid then it requires alkaline to clean it up. 4. We will now make a cleaning solution, Choose step 4a if your battery is alkaline and step 4b of your battery is acid-based. Pour 1/2 teaspoon of vinegar or lemon juice into a bowl. Mix in 1 1/2 teaspoons of water. Put 1/2 teaspoon of baking soda into a bowl. 5. Now its time to clean up the battery leakage, get a tootbrush or cotton swabs and dip it in our solution then rub it on the surface of the stain. Voila !! !, You’ve just finished cleaning up battery leakage. 1. Remove the battery When you know that you will not be using the device for sometime. 2. Change the battery of the device once it ran out. 3. When buying, select a good brand of battery.